A Mouse Reading Outside the House. While reviewing Secrets at Sea we jotted down a list of books: main character... MICE. Quickly we found that most of the books we really, really liked and many we absolutely loved. Truth be told we cannot get enough of little anthropomorphized mice. Give them a sword, we want them on our side; give them a dress, we want to invite them to our tea party; make them talk, we want to listen to their story. 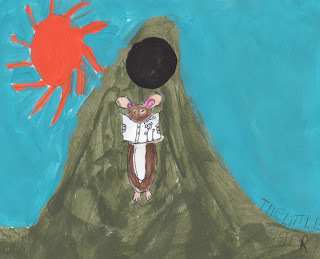 What is it about these little creatures that in books we love, but scurrying around in our homes, well, we grab a trap. --tell us about why you love them. why YOU like the book. tell us Why You Love Mice in Books SO Much! Title of the Book, Author, and your thoughts on the book. one of the first books that comes to mind and so fun to read! btw, lillie is just LOVING secrets of the sea. thanks for the rec! I love Tale of Despereaux, of course!!! Such a cute mouse! Who doesn't love Despereaux?!?! I remember reading Frederick by Leo Leonni to my children and then the Big and Little Sisters! Oh, so dear!